Sometimes the universe gives you what you need to hear, what you need to absorb in your life even if you aren’t looking for it. In the last weeks, I have had so many messages spiraling around me. Sometimes it is hard to see the messages as personal, but sometimes it is so evident that you just have to find a quiet space and allow the message to penetrate into your soul. At least that is what I have found. A little over two weeks ago, a good friend came to visit me at work so we could chant together. The chanting was powerful, really powerful. The chanting brought me to a more centered space which then translated into a desire to create, to follow my dreams, and to serve. We ended our chanting with a plan to create a mini-retreat for a non-profit organization I am creating. More on that later this week. Since I started listening, the messages have kept coming and have helped me to see and to do many thing in the recent weeks. The bottom-line is that even in my crazy schedule, I am fluid and I have to be open to the possibilities that surround me. Regardless of the seeming realities, infinite possibilities surround me. I just have to keep my heart, my mind, and my soul open to the quiet whispers or sometimes the loud proclamations. The time has come for me to listen to the voices that inspired me to chant these two chants. I am so grateful to my friend for teaching me a chant that helped open my heart to the beautiful voices that live both externally and internally. Both have so much to teach me. After chanting this morning, I did what I often do in the mornings, I opened up Facebook to see how my friends would enlighten me with knowledge, great sayings, photos or experiences. One friend posted a photo he received from the Facebook page Colours to Life. Alright folks, I get the message. 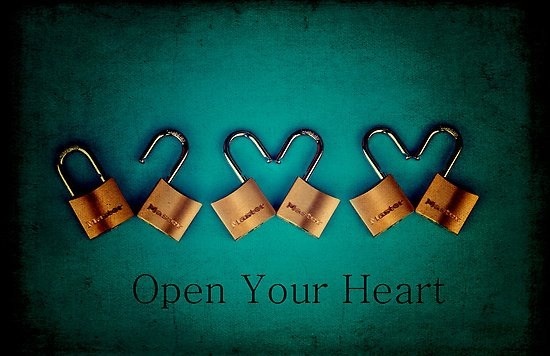 It is time for me to both ‘open my heart’ and to enter the gates to righteousness. There is so much work to do! Hineini, Here I am. I am here to serve and to listen to the wisdom the universe gives me. The journey is so exciting. PS-I just read my last posting called Quiet Reflections, http://wp.me/pthnB-7u it is ironic that in the beginning of October, I said that I “strive to listen to the inner voices and to trust the silence.” Looks like I have and I am looking forward to this process to continue. ah, with each breath, i remember a little more deeply. reflecting on the realities of my heart and the realities as seen by others. each memory leads to clarity; the question is. . .am I listening to the small and the big voices. as I move through the 10 days between rosh hashana and yom kippur, i strive to listen to the inner voices and to trust the silence. my hope is that allow the silence to flow through me as a means of gaining perspective and clarity. i am learning that the silence between the words is often the best aspect of any thought or conversation. unspoken words and deep breaths often exhibit the essence of what is real. may you and yours be blessed with insight and wisdom as you listen to both the spoken and unspoken words.